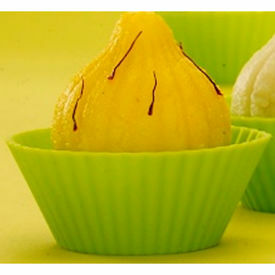 Special Limited Edition of Sugar Free Modak Box for Ganesh Chaturthi Festival Pooja - One Box contains approx 8-10 pieces. No Side-effects of synthetic sweeteners, since natural sweetener is used. Important Note: This product is perishable in nature, please use this within 3 days of opening the sealed pack. Special Limited Edition of Sugar Free Modak Box for Ganesh Chaturthi Festival Pooja - One Box contains approx 8-10 pieces. 100% Natural Sugar Free: No Artificial Sweeteners Used. Made of Dezire Natural Low Glycemic Sweetener No Bitter After-Taste - compared to sweets made with Artificial Sweeteners No Side-effects of synthetic sweeteners, since natural sweetener is used. Low Calorie compared to Sweets made with Cane Sugar Suitable for all including Health Watchers, Calorie Conscious & Diabetic Friendly Important Note: This product is perishable in nature, please use this within 3 days of opening the sealed pack.